Some people just walk into a room, and every eye and ear are immediately tuned into them. Is this magic? Doubtful. In reality, that person has worked very hard over the years to gain the respect of the people who work around him. You can earn the respect of the people with whom you work as well. Sure, on television or in the movies, it's always the rogue cop or the office worker who pushes the limits who wins the rewards and praise. In real life, it's the person who does what they are supposed to do. This is especially important if you're the boss or work in a management role. The boss who slacks off from working, comes in late, leaves early, and spends more time shopping online than working, won't engender respect from the coworkers. While the effect of rule-following isn't as strong among peers, it still plays a critical role. People don't respect people who don't respect the rules. This is especially true in a workplace where most employees do follow the rules. After all, they were put in place for a reason. Whether to create workplace harmony or to fairly and ethically deal with employees, workplace rules most often are carefully thought out. This is one area where the television shows get it right—that cop may break all of the rules, but he certainly puts in the hours. Now, working hard doesn't mean you need to work 80 hours a week, but it does mean that you need to work when you're supposed to work. If you're an exempt employee, you'll probably need to put in a bit more time than the office norm. If you're a non-exempt employee, make sure that you clear all overtime with your boss before working it. You don't get respect by working off the clock or by surprising your boss with your time card. Working hard also means that you need to spend your work time on work. You won't earn the status of a respected employee if you are viewed by others as a person who steals time from your employer. 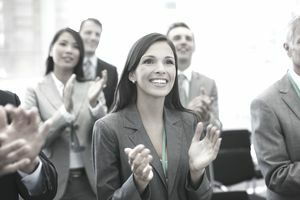 You may think that the person with the most respect is the one standing at the head of the conference table giving the presentation, but that's not always the case. If you feel as if you always need to talk, you're not likely the most respected person in the room. People gain respect by actually listening to the ideas of others. This doesn't mean that you can't share your ideas, but it does mean that you need to pay attention to what others are saying. Remember, you were hired to do your job, and other employees were hired to do theirs. That may seem like a super basic statement, but, in practical terms, it means that other people are experts on tasks outside of your expertise. So, listen to what they have to say about their area of expertise. Recognize that, in listening to your coworkers, you treat them with respect. This respect engenders respect for you and what you have to say. When the accounts payable person tells you that it will take three days to get the supplier's check cut, don't assume that it's because she's lazy. She may be lazy, but she probably also needs to follow required processes and procedures that restrict her ability to respond to your timeliness requirements. Just because you don't understand why or when something happens doesn't mean that a valid reason doesn't exist. The last part is critical in many situations—otherwise, the apology is just an empty statement. If you're the boss, you take the blame for the team's failures as well as your own. If you're an individual contributor, you need to take the blame for your own missteps. A mistake isn't a career ender. Not admitting a mistake can become a career ender. Having people respect you isn't dependent on people thinking that you're right all of the time. It's about people trusting you and appreciating what you have to say. Just like you need to take your lumps when you make a mistake, you need to listen to what people have to say about you. Your boss thinks your marketing plan stinks? Well, ask her why and carefully consider what she has to say. Your direct report thinks that your marketing plan stinks? Well, ask her why and carefully consider what she has to say. Those last two lines weren't an accidental repeat of the preceding lines. Whether the criticism comes from above or below you must carefully consider what the person had to say. Go ahead and ask questions. They may be right. They may be dead wrong, but you won't know unless you consider it. If someone criticizes your personal appearance, family status, race, gender, whatever, you can certainly call them on it. “I'm sorry, the fact that I look young has what to do with this?” Standing up for yourself is critical to earning respect from coworkers and bosses. On the other side, though, don't go looking for offense where no offense is intended. If you get upset about every little comment anyone makes, you'll look like a whiner. Some things, you just need to let them go. Think about who you respect the most. Is it someone who pushed people under the bus right and left on her way to the top? Probably not. (And if it is, please consider getting therapy.) Instead, you undoubtedly respect someone who was kind and helpful. So, if you want others to respect you, try doing the same. Take time to mentor. Don't get angry when your direct reports, peers, or bosses make mistakes. Just help them get the job done and done right. When you lift up those around you, you all rise together.